Spirit Of Xaar ran another good race tonight (27/2/2013) over a mile, under the lights of Kempton. Under Robert Havlin, he wasn't the quickest away from the stalls in the 14 strong field, but quickly progressed into a midfield position. Turning into the straight he moved up into a challenging position and looked the likely winner, until the odds on favourite,who had been held up at the back, streaked down the outside to catch him in the final furlong and go on to win by a length and a quarter. Xaar comfortably held onto second place. Frankie's flush, while Southfield leads the country. Stable lass, Frankie, came away from Plumpton today £100 richer after winning a rather special "Best Turned Out" award with Clonusker. As well as the £50 from the sponsors she received another £50 from the 2013 EPDS - Racing Welfare competition series which started at Plumpton today (25/2/2013). She also received a bright red commemorative gilet. As this was the first award in this year's series, Southfield Stables is the current leader in this national competition where £1000 is given to the winning yard in November. 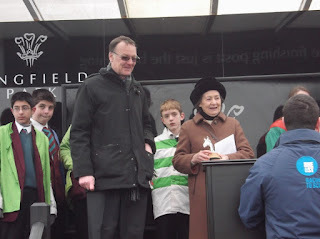 However, with just one race a month in the 10 race series Linda may well have to send horses to Hexham and Carlisle to gain enough points to secure the prize. 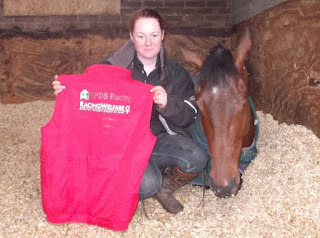 Frankie with her gilet while Clonusker has a rest. 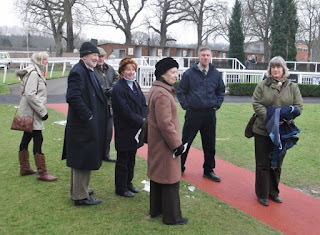 Spirit of Xaar ran another good race at Lingfield today (15/2/2013) over 7 furlongs. Robert Havlin jumped him out quickly from the widest draw of the 10 runners and was able to move across to track the leader on its outside. This was maintained until entering the straight. A four way battle to the line ensued, with under a length covering them at the line, where the photo showed that Spirit Of Xaar was third winning £302 for his effort. Red Anchor won his first ever race today (12/2/2013) in the mud at Lingfield. Andrew Thornton and Linda decided to employ different tactics and he was sent straight to the front at a sensible gallop in the conditions. He jumped well, with the exception of the final ditch where jockey and horse had different ideas about when to take off, and he responded to Andrew's urgings coming down the hill to the home straight. He continued to run on and sealed it with a good leap at the last. 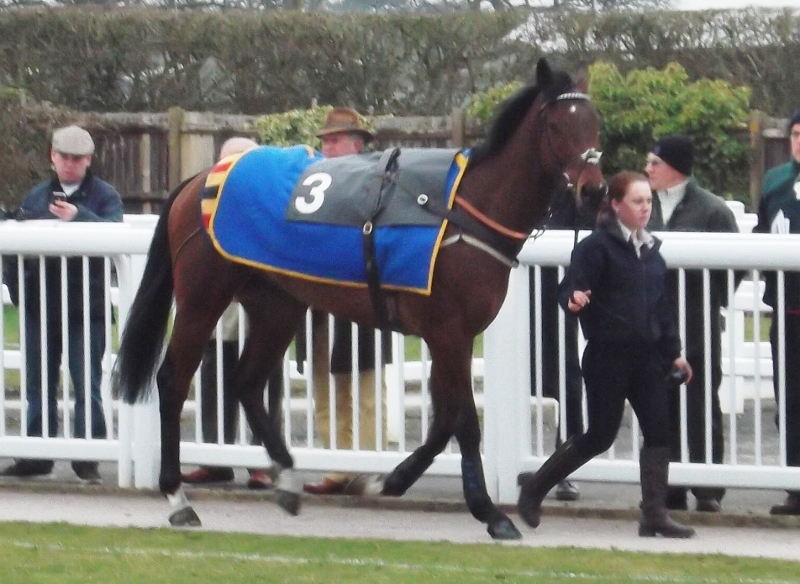 It was great for his owner, Sally Stanier, who has been very patient with him and for those who backed him at S.P. 20/1 or better. Anxious connections before the race. Sally leads her winner in. And a trophy as well! Later in the afternoon, Itoldyou finished 3rd in a novices handicap chase. Andrew Thornton again rode and employed similar tactics. 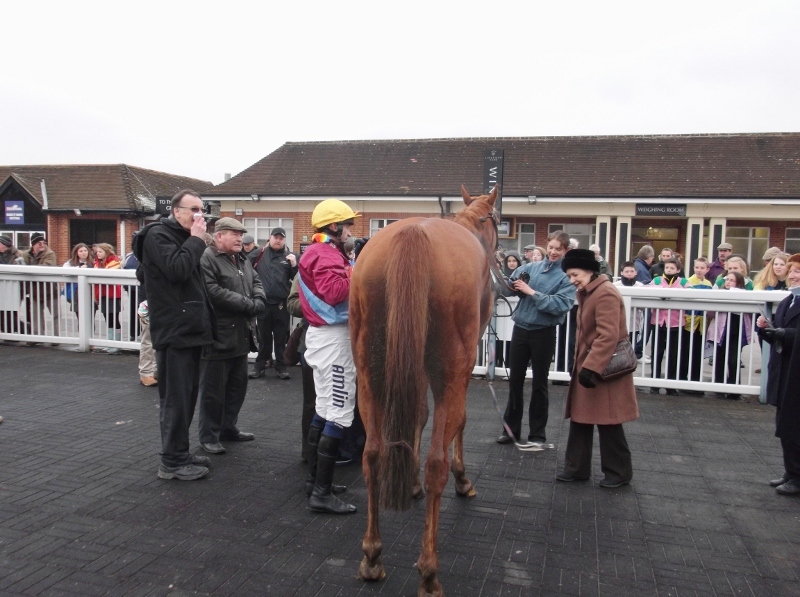 This time however Itoldyou was unable to hold his lead entering the home straight and had to settle for last of the three finishers and a prize of £500. 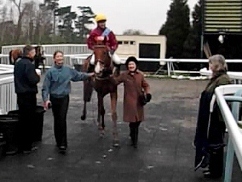 Itoldyou showed his potential when finishing second in a class three chase at Sandown (2/2/2013). Ridden by Tom Cannon he was settled at the rear of the 5 horse field. He jumped well and made a forward move jumping the railway fences on the final circuit. He was ridden from the bend as the front three pulled away. 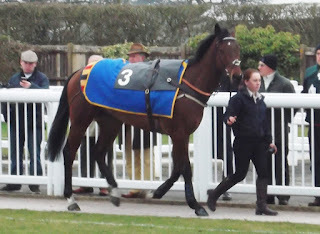 He stayed on up the hill after the last to take second place, 5 lengths behind the winner and favourite. This was an additional race that opened late to make an all chase card when the hurdles track looked likely to be unfit, as was the case, and Linda and the owners were rewarded with a nice prize of £2772.